What Does It Mean to be Very Compassionate? It's very nice to be a very compassionate person. What does it mean to be very compassionate? Well, it means that you care about all living creatures. In order to be kind to animals you must allow them to walk freely in the wild, let them die a natural death and help them so they do not live in their own feces. Many so-called Christians are against these ideas. They say that you should not be against killing animals, but we all know it's wrong to kill. If you read the story of the cleansing of the temple you must understand that Jesus does not like it when people are rude to his friends the animals. Slaughterhouses and factory farms are just prisons and death camps, and the animals' situation are worse than the Jewish situation during the second world war. Would you like to live in a factory farm and be sent to a slaughterhouse? I am also very against the world's propaganda. There is not much talk about the animals. 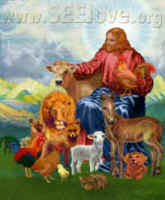 Now it's time for you to become compassionate, and care about the animals, like Jesus Christ does. He was a real animal rights activist. Jesus even accepted to be crucified so that we wouldn't need to sacrifice animals anymore. Have you read Isaiah 11:6-9, and do you know the fifth commandment? Thou shalt not kill! Go on to: What Happened to Christ’s Second Commandment?